Bonobos & Their Forest – Radio! “At current rates of deforestation, the Congo rainforest will be gone by 2100. And if that year seems to be in the distant future, consider that many of today’s kindergarteners will still be alive to see this complete destruction of what is currently the second largest rainforest on the planet. The good news? You can change the outcome. With nearly nine million acres already under protection and two million more on the way, the Bonobo Peace Forest provides real solutions.Your support keeps the Bonobo Peace Forest growing. Sally Jewell Coxe is president and co-founder of the Bonobo Conservation Initiative. 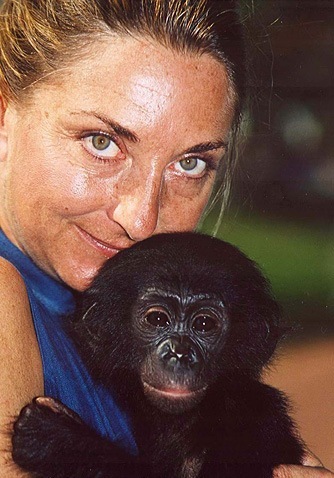 Known as “Mama Bonobo,” Sally has worked tirelessly for over 20 years to protect bonobos, preserve the Congo rainforest, and empower Congolese communities as leaders in conservation. Currently based in Washington, DC, Sally spends extensive time in the Congo, directing BCI’s field activities and building relationships with Congolese partners. Respect for indigenous wisdom and culture is central to BCI’s philosophy. Focusing on partnership with the people who share the land with bonobos has helped to establish a new, holistic paradigm for wildlife and rainforest protection. Under Sally’s leadership, BCI collaborates with partner organizations, the DRC government, and local communities to manifest their common vision for the Bonobo Peace Forest. Sally became fascinated with bonobos while Senior Copywriter at the National Geographic Society. Her devotion to the planet as a living being, and her service-centered life have deep spiritual roots.